Go for home-made samosas. You can never trust how many times the oil outside was re-heated, and repeated heating of oils can add to a lot of trans fats. Purchase good quality fresh ingredients, and make sure you take a look at the food labels. Wheat flour, ragi flour, bajra flour, multigrain flour, etc. can all be used for the outer crust, you don’t need maida at all. You can add some corn floor to facilitate binding while using millet based flours if needed. Fill in vegetables wisely. Leave the potato alone. You can fill in carrots, beans, peas, paneer, spinach, cabbage, etc. Unripe bananas can be used to mimic potatoes, you can’t tell the difference! Paneer filled samosas are tasty and high in protein as well. You can also add cooked multigrain noodles and make yourself a Chinese samosa! You can let some flaxseed powder, roasted oats or sesame seeds enter along with the spices to boost the over-all nutritive value of the dish. Use soya, olive or canola oil to sauté the vegetables instead of sunflower or groundnut oil. Seal the samosas by rolling the edges into curls instead of using ghee or butter. Allow your samosas to bake. If the vegetables within are well cooked, baking is a good idea. You can also flatten the samosa shape slightly and sauté it on a tavva with a little rice bran oil. You can add some mashed whole wheat bread or a little soda to make the unfired crust crisp. Let mint chutney accompany the samosas. You can also make a samosa chaat where you can top it with curds, peas, and mint chutney or convert it into a samosa curry with your samosa portions in a tomato or spinach based gravy just like koftas. Another way is to make tiny one bite samosas and line them up on toothpicks or barbecue sticks with fruits like pineapple cubes and cherry. Have fresh samosas to make most of the nutrients you can get from it. Don’t forget to set a limit before you decide to have too many together! 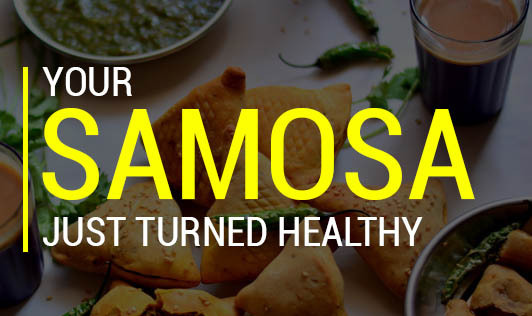 Follow these tips and enjoy snacking over a samosa with no regrets!